A hymn of praise — the venerable Old Hundred — here presented as sung by a Floridian singing school in the shapenote singing tradition. 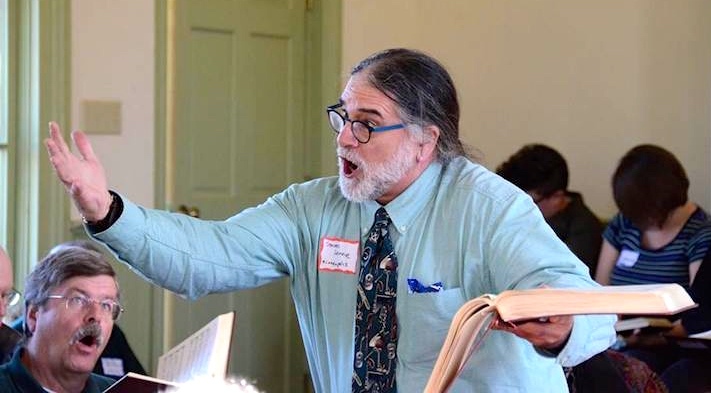 Yes, the singers happen to be alligators, but then Sacred Harp and similar traditions are noted for their hospitality to all those come to sing. The composition is a little gift to Steven Levine (who is, among many other things, a Shape Note singer), on the occasion of his birthday, today. The background image is a Happy Birthday card that Emily Rizzo (who lives in Florida, where the alligators come from) presented to Steven on Facebook this morning. My alterations, with the help of Kim Darnell. 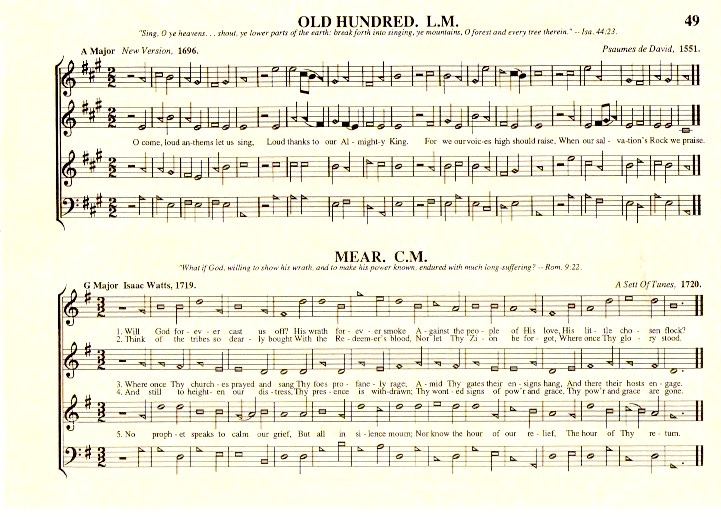 “Old 100th” or “Old Hundredth” (also commonly called “Old Hundred”) is a hymn tune in Long Metre from Pseaumes Octante Trois de David (1551) (the second edition of the Genevan Psalter) and is one of the best known melodies in all Christian musical traditions. The tune is usually attributed to the French composer Louis/Loys Bourgeois (c. 1510 – c.1560). Although the tune was first associated with Psalm 134 in the Genevan Psalter, the melody receives its current name from an association with the 100th Psalm, in a translation by William Kethe entitled All People that on Earth do Dwell. The melody is commonly sung with diverse other lyrics as well. The first lyrics were translated from Psalm 134 – in English, “You faithful servants of the Lord, / Sing out his praise with one accord”. Later set to Psalm 100 – in English, “All people that on earth do dwell, / Sing to the Lord with cheerful voice”. Also commonly sung to this tune is a paraphrase of Psalm 117 by Issac Watts, with the Doxology as its final verse – “From all that dwell below the skies / Let the Creator’s praise arise” (a text set to three other tunes in the 1991 Sacred Harp: Schenectady 192, Bridgewater 276, Eternal Praise 377). And then the text above, a paraphrase of Psalm 95. That’s 49t. Photoreproduction brings us, for free, 49b, Mear. 18th-century tune and (by Isaac Watts) words, with a harmonization in which the treble (high harmony, staff 1) line is a countermelody to the tenor (melody, staff 3) line. This entry was posted on September 27, 2017 at 2:55 pm and is filed under Music. You can follow any responses to this entry through the RSS 2.0 feed. You can leave a response, or trackback from your own site. Do alligators customarily lead OLD HUNDRED with a baton? Just as singing customs differ from one place to another, so they differ from one species to another. Florida alligators have their own ways. 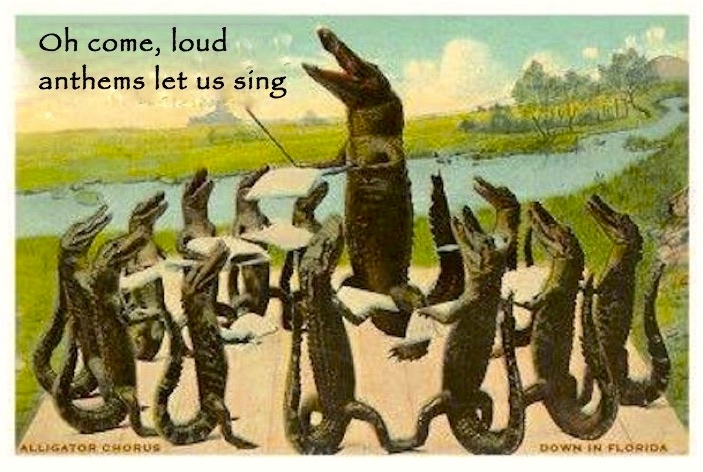 Notice than when singing on their feet, vs. singing while seated, the alligators don’t form a proper hollow square, but arrange themselves in a rough circle. In my experience, human singers often do that too. I don’t think I’ve ever seen an alligator sit down, come to think of it. And singing customs differ even within the species from one population to another, Cher. Louisiana alligators sing in French, including, in place of The Star Spangled Banner, la Banière Êtoilée. And Sout’ Louisiana children learn the names, not of Santa Claus’ reindeer, but of his alligators, I guarantee. I will be deeply disappointed if this is not intended as a subtle Charlie’s Aunt reference. You have no reason to be disappointed.